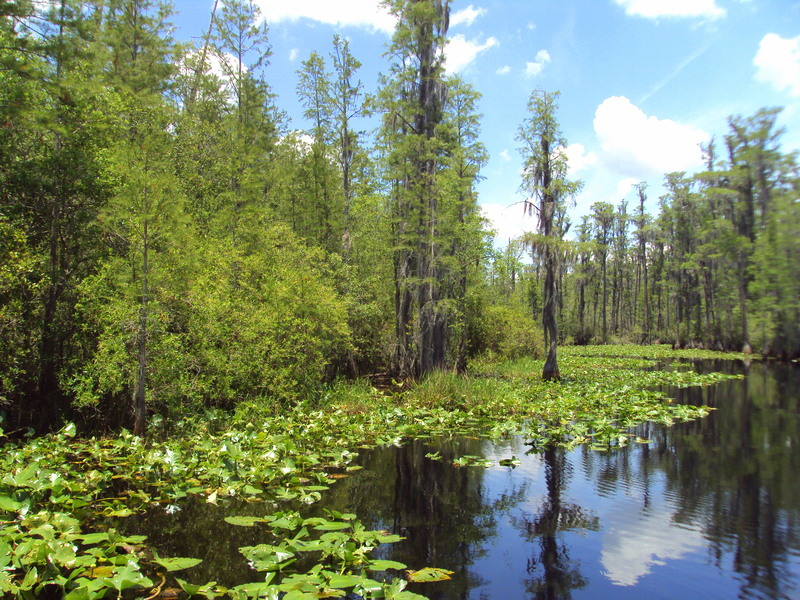 The Okefenokee Swamp is at the Georgia-Florida border and is an experience not to miss. Unless of course you have swamps of your own with alligators galore, boat trails (vs hiking trails), and glorious mosquitoes (insert sarcastic font here–but only about the mosquitoes). We’ll pause for a phonetics lesson. The cypress trees grow on peat, not soil. A simple poke makes them bounce in the water like a buoy. As the Native Americans navigated the land they bobbled along this powerful and trembling earth. The swamp is impressive in scale and more so in what’s hidden. While we’re exposed to the brutal sun, the world underwater is active. The swamp is stagnant, yet you can drink from it! Methane gas and tannic acid make the water black, but clean the toxins so it’s potable. High school friend Regina and I rented a motorboat and steered our way around gators and lilly pads, through grass, and into narrow alleys. The power of driving our own boat was exhilarating and freeing. There were a few gaffs with flooding the motor, but patience and gracious fishermen served us well. While it’s quiet and has little innate movement, the strength is palpable. The gators are active, the water ominous, and the plant growth rampant. Like hiking, there are blazed trails on the water-ways, yet somehow there’s a greater sense of getting lost. Perhaps because it’s not my natural habitat. Can you transition your skills from one habitat to another? Want to see the alligators and the special trees? Stay tuned for future posts (oh the agony of being patient).